This is to inform both fresh and stale undergraduate students of the Federal University Ndufu-Alike Ikwo (FUNAI) that the management of the institution has released the amount payable as school fees for the 2018/2019 academic session. Read Also: FUNAI Academic Calendar for 2018/2019 Session. 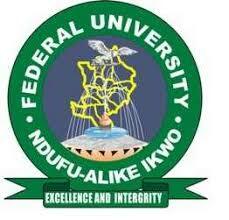 Approved Charges for FUNAI Newly Admitted Students. Approved Charges for FUNAI Returning Students. Note that all approved charges must be paid before online course registration could be completed by the returning students.